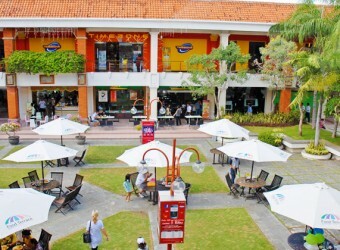 Mal Bali Galeria is very popular among local people and foreigners. It’s located in the back of Duty Free Shop on Jalan By Pass Ngurah Rai. The visitors definitely can easily find anything they need here. This mall consists of many shops and super market such as Matahari Department Store, Hypermart, Ace Hardware, Gramedia Bookstore, CD shop etc. I didn’t know that there is such a big supermarket in the back of DFS. It is very large and there are food courts, game center and beauty salons. It is good to spend the time a day here.